How do you feel about this dress? I was hesitant because I felt it made me look too boxy and 'full' in the waistline. But given the short length paired with the arched cut at the waist, I suppose it works. I kept it very simple with my shoes and accessories. You know I love an all black and white look! 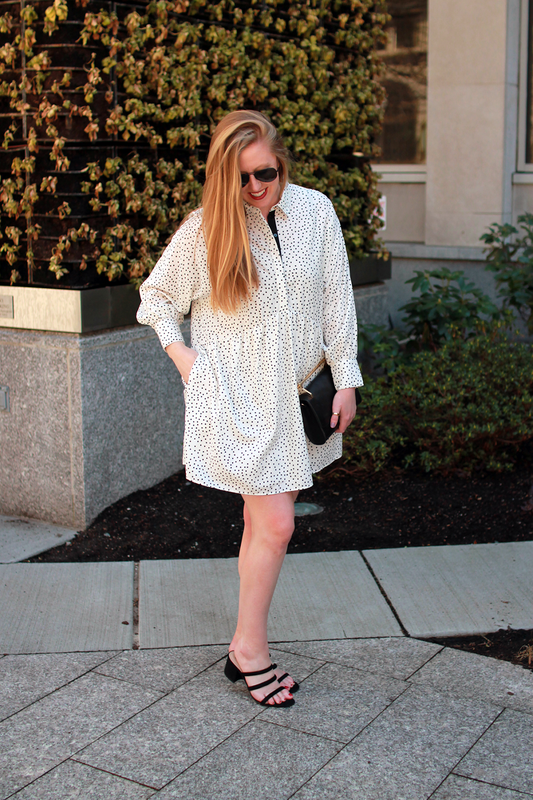 9 comments on "Spotted in Spots"
That shirtdress is so chic and I love those strappy sandals so much. It is all very elegant! The polka print is so adorable on this dress. Love the flowy fit too! Thanks Jess, I love it too! I've been thinking about getting this dressed & now I'm convinced! You rock it! You should totally snag it! I bought it in 2 sizes and ended up with the larger size because I needed the length. Still have yet to return the other... Whoops! Hope you love it!